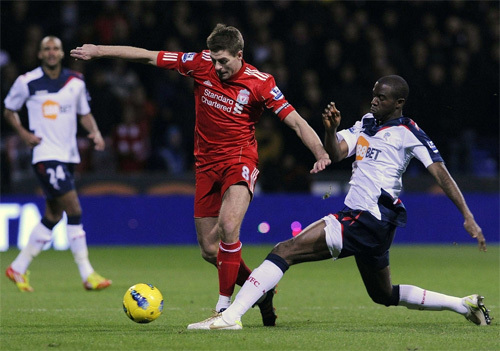 Liverpool are still waiting for their first Barclays Premier League win of 2012 after they went down to a 3-1 defeat to Bolton Wanderers at the Reebok Stadium on Saturday evening. The home side stunned the Reds by opening the scoring inside four minutes when Mark Davies prodded beyond Pepe Reina after breaking into the area. 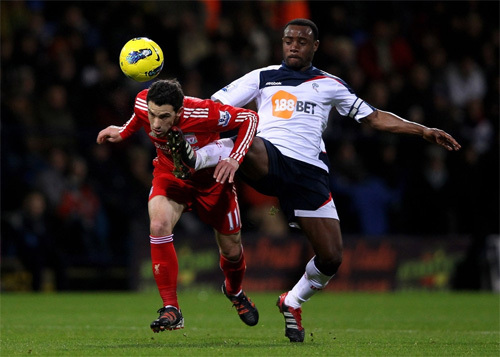 Nigel Reo-Coker then doubled Bolton's advantage just before the half-hour mark when he hooked home from close range from Chris Eagles's pass. Craig Bellamy pulled a goal back on 37 minutes when he sped beyond the Bolton defence to latch onto Andy Carroll's flick and clip over Adam Bodgan, but Gretar Steinsson made it 3-1 five minutes into the second half. Daniel Agger struck the top of the crossbar as Liverpool looked to get back into the contest, but they were unable to mount a sustained spell of pressure as the Trotters claimed victory. 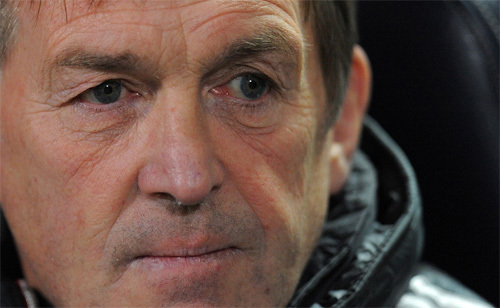 Kenny Dalglish opted to make four changes to the side that had begun last week's goalless draw with Stoke City at Anfield. 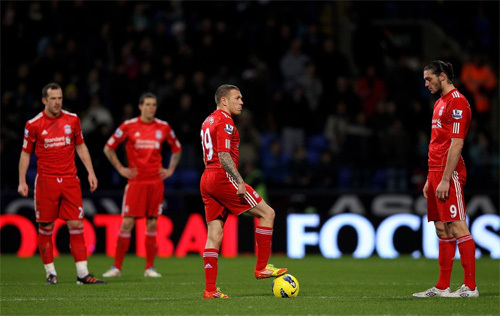 Bellamy, Carroll, Agger and Maxi Rodriguez all returned as Liverpool went in search of a fifth successive victory at the Reebok Stadium. 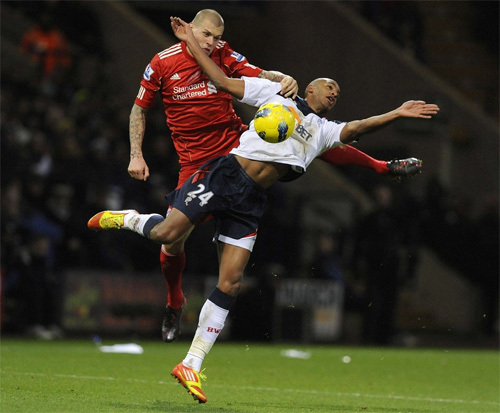 For Bolton, former Reds striker David Ngog spearheaded their attack to come up against his former teammates for the first time since swapping Merseyside for Lancashire in August - and the Frenchman was instrumental in helping his side take a fourth-minute lead. It was his flick that allowed Davies to burst into Liverpool's box, hold off the challenge of Martin Skrtel and stab a low effort into the bottom corner. Moments later, the Trotters almost furthered their advantage when Eagles muscled his way past Jose Enrique into the danger zone and flashed a shot right across the face of goal. The home crowd were understandably delighted with the start their side had made, but the Reds threatened on 10 minutes when Reina's long kick sent Maxi into space in the box, but the ball struck the Argentina forward's hand as he attempted to control it. It had been a nightmare start for Liverpool, but after a Bellamy shot was blocked in the area, Jordan Henderson's drive was stopped by Bogdan. Next, Steven Gerrard's inch-perfect pass picked out the head of Carroll, but his effort was collected by the goalkeeper with the lineman's flag raised for offside. The visitors were then left appealing in vain for a penalty when Charlie Adam's free-kick into the box struck Carroll and bounced against the hand of Zat Knight, but referee Kevin Friend waved away the claims. 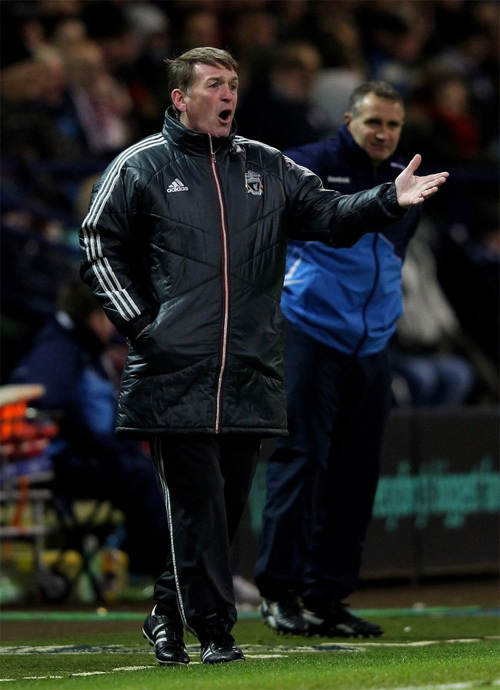 And Bolton left Dalglish's men with a mountain to climb when Reo-Coker made it 2-0 on the half-hour mark. Eagles held onto possession on the edge of the box before clipping a pass into the run of the Trotters' captain, who controlled the ball on his chest before dispatching beyond Reina. 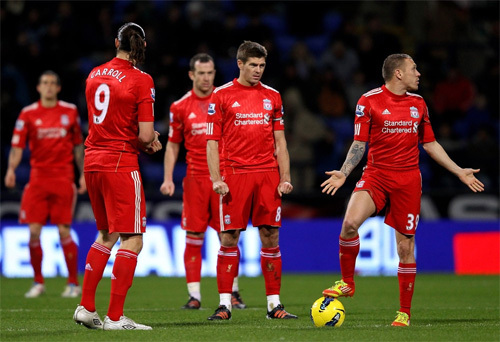 Liverpool were able to muster an almost instant riposte, however, when Bellamy reduced the arrears eight minutes before half-time. Collecting Carroll's flick-on, the Wales forward outstripped the Bolton defence for pace before delicately chipping the ball over the advancing Bogdan. 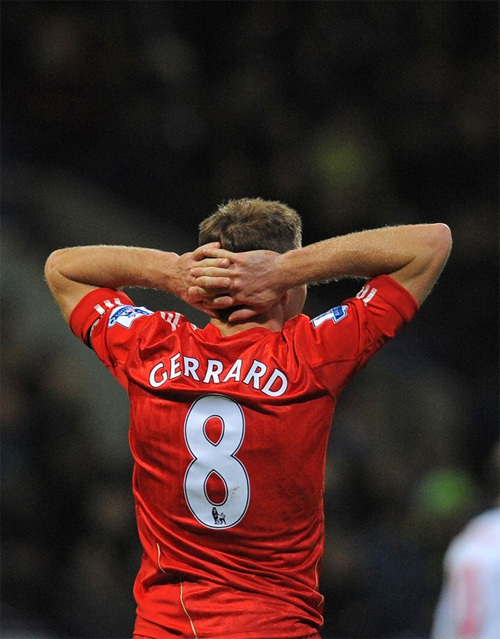 In first-half stoppage time, Gerrard attempted to do similar as he latched onto Agger's pass, but the captain's left-foot drive was turned away by Bodgan. There was still time remaining for Martin Petrov to force Reina into a full-length stop from a free-kick, and Dalglish would no doubt have been demanding much more from his charges during the interval. But any hope Bellamy's goal had given Liverpool of salvaging something from the contest was undone five minutes after the re-start when Steinsson restored Bolton's two-goal advantage when the full-back reacted quickest to David Wheater's header back across goal from a corner to sweep a low volley into the back of the net. With just over 25 minutes remaining, and Bolton still looking dangerous, Dalglish opted to make a double change with Dirk Kuyt and Stewart Downing replacing Maxi and Adam. 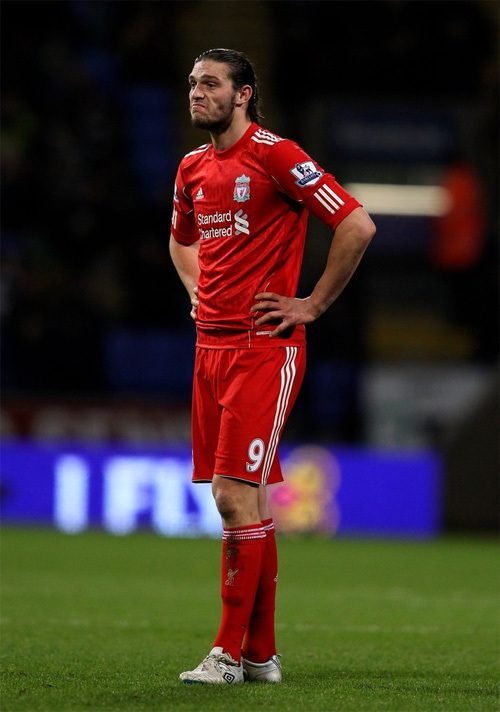 Soon after, Carroll almost capitalised on a poor touch from Eagles inside the Bolton box when he stabbed over following Glen Johnson's centre before Agger struck the top of the crossbar after striding forward and letting fly from distance. However, the hosts remained dangerous and Eagles went close with a shot that deflected inches wide of the post as the game drew towards its conclusion. At the other end, the Reds were unable to trouble Bogdan again and left to reflect on a disappointing evening at the Reebok.